Crab Abalone Sauce Recipes Can Be Tested .Is famous for its sea food nutrient content and protein were outstanding, so it is not uncommon to many who are so fond of seafood, both cooked yourself or buy ready-made in shops or specialty seafood restaurant. One type of seafood is much preferred is the crab. These animals usually live on land and in water, although it is usually more prevalent in the water. The crab has a hard shell and claws sharp. The flesh is not too much but has a soft texture and taste very delicious. One of processed crab worth a try is the oyster sauce crab recipes. Spicy taste making it suitable for those who like a burning sensation in the mouth. 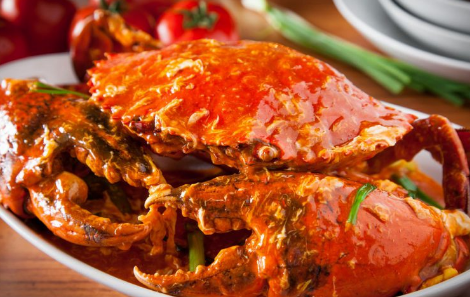 Besides crab, oyster sauce , marine animals can be processed into a variety of other foods with different flavors, such as sweet and sour sauce crab crab soy sauce. But for those who love the thrill of spicy flavor, crab, oyster sauce would be a very suitable choice. As the name implies, this menu using complementary materials in the form of oyster sauce tomato sauce on the side. The end result is a soft crab meat mixed with a spicy sauce to produce delicious flavor. Especially for lovers of spicy food, certainly should not miss this one food menu. Menu crabs can be found in the shop or seafood restaurant, but we can also cook it yourself. So that the end result is maximum, select fresh crab is a crab that was still moving fast. To supplement ingredients and marinade also select a quality that the end result is more tasty and nutritious. We can buy a crab in supermarkets or traditional markets, especially if we live on the territory adjacent to the sea so it will easily find sellers of seafood including crabs. Crabs are usually sold per kilogram price is relatively expensive, but it is commensurate with the nutrients in it and feels pleasure when it is processed. Here is the recipe of crab, oyster sauce spicy complete with ingredients and method of manufacture. Oil enough to be used for sauteing. Crab, oyster sauce recipe begins with washing clean the crab to be cooked. After it boiled crabs in boiling water until completely cooked. Lift the crab and then drain. Saute ground spices using a little oil until fragrant smell. Add the ginger, galangal and lemongrass. After that enter the bay leaves which have previously been washed clean. Pour enough water into the spice that was sauteed and wait until the water is boiling. Then enter the crabs that had been boiled into the seasoning. Combine tomato sauce, oyster sauce, cayenne pepper delicate, pepper, salt, sugar and flavorings. Stir until all ingredients are evenly mixed. Wait until cooked. Turn off the stove and then move crab, oyster sauce onto a serving plate. Crab, oyster sauce ready to serve. 0 Komentar Untuk "Crab Abalone Sauce Recipes Can Be Tested"